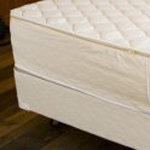 A latex mattress is supported by a rigid surface—a foundation or platform bed. Our matching foundation replaces the boxspring in a bedstead or frame. The foundation is a rigid wooden support made of untreated pine, with three-quarter-inch slats spaced 2.5” to 3” apart. It is enclosed in the Savvy Rest organic casing. Height: Standard (9”) or Low-profile (5”).